My greatest source of misery. At night when I sleep, the positions go between fetal (curled up in a ball) and straight-back (sleeping on my tummy). I only change because my lower back hurts. When I stand too long, my lower back hurts. This morning I tried doing ab-work. Guess what? I couldn't finish the routine because my lower back hurts! I did a measly 20 crunches, 10 side crunches and 10 flutter kicks. And I got halfway through the next set. When planking - the only reason I stop is, not because my abs are tired, but because my lower back feels like its "sinking down" in pain. Currently I have a habit of planking for as long as I can (I don't time - just plank to failure) as soon as I get up in the morning. I don't know if that's helping anything? Push ups also make my lower back hurt. I did the Back & Core program before - but it just felt really easy to me? Do I just add more reps/sets when it feels that way? How often do you stretch? Have you tried stretching your hamstrings more often if not that is what I would suggest. I never stretch - I guess I should start. I usually just warm up and go. I agree with stretching the hamstrings, but also the quads, hips, and lower back. Just make sure to warm up first. Also, stretch at the end of exercise, since you are already warm, before cool-down. There's no point or benefit in stretching cold. 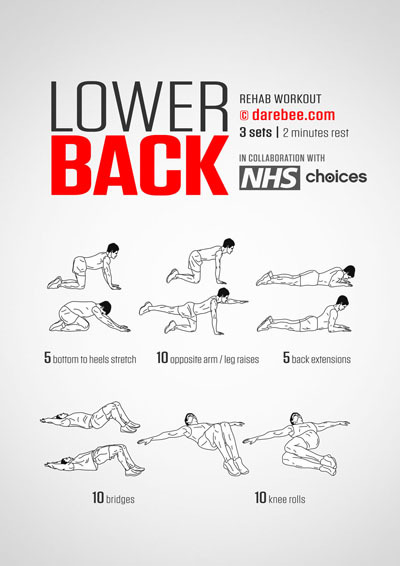 You can warm up dynamically (with exercises: https://darebee.com/filter#sort=posi...me=warm&page=1), with hot pads, or infrared lights. I also suggest you browse through this YouTube channel: https://www.youtube.com/user/physicaltherapyvideo. You will find science-based information and recommendations on lower back pain and all kinds of other things that will help. They will show you how to use pillows to relieve back pain (under knees when face up, under belly and shins when face down) and how to get in and out of bed properly (using your body like a pendulum). They also show you how to warm your back and other parts of the body with infrared light devices. They are little bit pricey but might be what works for you. My lower back can be stiff when waking up, then doing some stretches (cat-cow, torso twists standing up and then normal twists lying down, child's pose, and downward dog to cobra shifts) help me. But of c ourse do with caution until you know how your own back reacts to those! PetiteSheWolf my back loves to cobra stretch... and to curl up in a ball. Like child's pose almost, but knees tucked even tighter. That's the reason I can barely sleep at night. It gets sore when it's straight too long, and when it's curled too long. Nevetharine, when you say that your back gets sore when it is straight too long, makes me think that perhaps you have an abnormal spine curvature. Have you seen someone? Nevetharine, low back pain is very common and unfortunately, it has many very different causes (injuries and related scarring, muscle tightness, structural issues - scoliosis, hyperlordosis, neurological issues, degenerative diseases, referred pain from other parts of the body, even emotional components can make it better or worse etc.). It's really hard to give advice without knowing or seeing where exactly it hurts, when it hurts, what makes it better, what makes it worse...if I remember correctly, you've been dealing with this for a while and I think it would be best if you could see a professional just to know where you're at. I know the financial investment can be substantial but finding the source of your pain could prevent issues (and costs) down the line. A semi-educated guess would be to look at your daily postures/movement patterns and make sure you're not stuck in unfavourable positions for long periods of time (sitting slouched etc. ), then maybe strengthening of the posterior chain (calves, hamstrings, back) and core would come into play. Stretching can bring some immediate relief (does it?) but I would avoid prolonged passive stretches if you don't know the exact cause/location of pain as that could make it worse. I never do crunches, always old fashion sit-ups, sit-ups help strengthen the lower muscles of the back. I even did them with a 35lb dumbbell behind my neck (feet anchored in that case) also holding a dumbbell with my feet and doing leg raises with same 35lb, because of the weight I'd have 50lb barbell plate on my chest so not to tip up. That was some years back but have never had any back issues. Old style sit-ups could be a good starting point. It's mostly when I do things like crunches, planks, push ups, and leg raises. It hurts right in the middle of my lower back. And yes, stretching does make it better immediately. About posture... I do have very bad posture. I sit slouched for most of the time, because I can't maintain a straight posture for long before my back also starts hurting. I even walk slouched. My hubby often reminds me to pretend I'm balancing a book on my head.